Budget home theater surge protectors can be a smart and safe investment. Investing in low-cost home theater surge protectors can be an effective way to save money and save your home theater from unexpected power failures. Naturally, affordable home theater surge protectors shouldn’t have any corners cut when it comes their constitution and dependability. High-quality surge protectors, whether they’re on the more affordable side of the slightly more expensive side, should be made up to a certain standard. The following cheap home theater surge protectors are not only affordable, but rated as some of the most reliable that can be bought online. 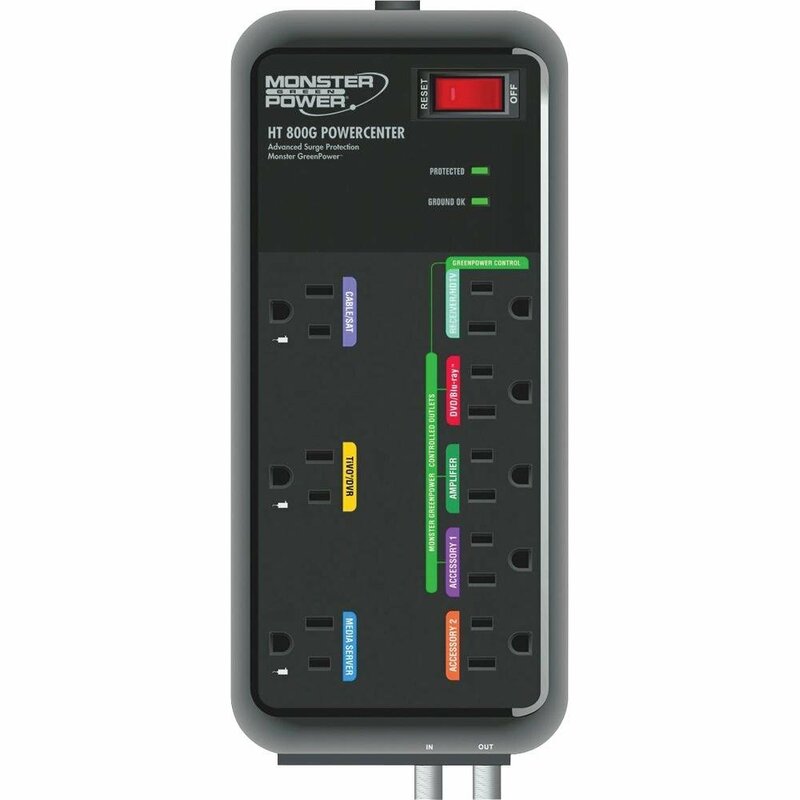 The Monster MP HT 800G surge protector produces 2160 Joules of protection while active. The surge protector is designed with 3 wide-set outlets, accommodating the greater space requirements of larger power chargers while leaving sufficient room for the smaller ones to be unobstructed. The MOVs are encased in ceramic shells as a countermeasure against the potential fire hazards of unexpected power surges. The Rocketfish energy-saving home theater surge protector is a fine choice for those who are more on the conscious side about their monthly energy bill. With this surge protector, not only can money be saved on the product itself, but there won’t be as much of a financial burden caused by its power consumption either. The CyberPower CSHT1208TNC2G home theater energy saving surge protector is designed with twelve surge-protected outlets and 6 energy-saving outlets. Each of the outlets has a safety cover for good measure. The surge protector has 4350 Joules of surge protection, a 45 degree offset plug, and an 8′ cord. 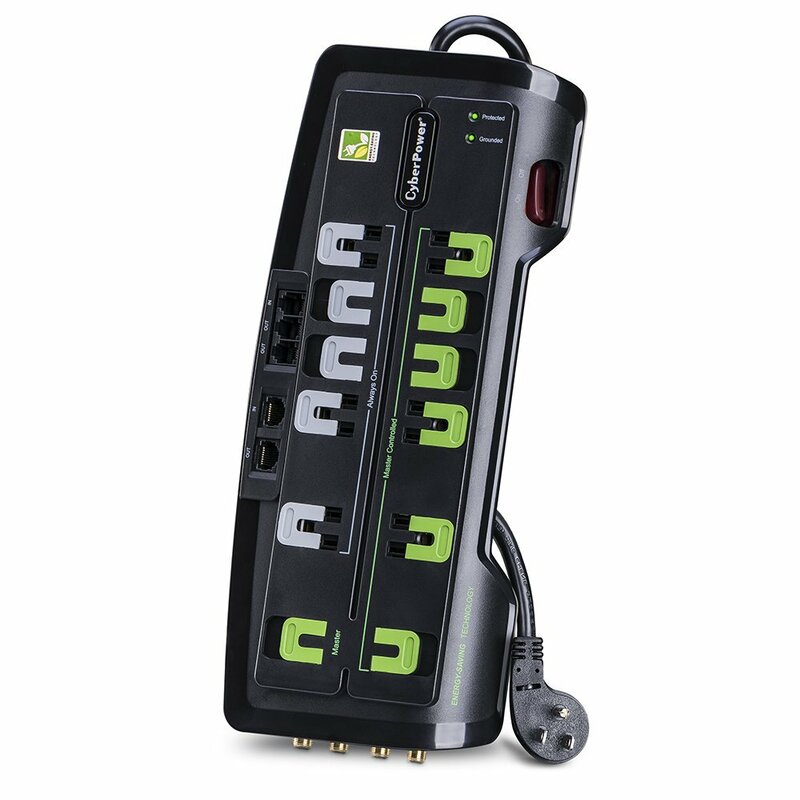 The Monster JP 700 home theater surge protector has seven surge-protected outlets, and each of them are component-labeled. This surge protector provides approximately 1440 Joules of protection. It has a 6′ power cord, surge-protected phone connections, and a set of surge-protected coax connections as well. 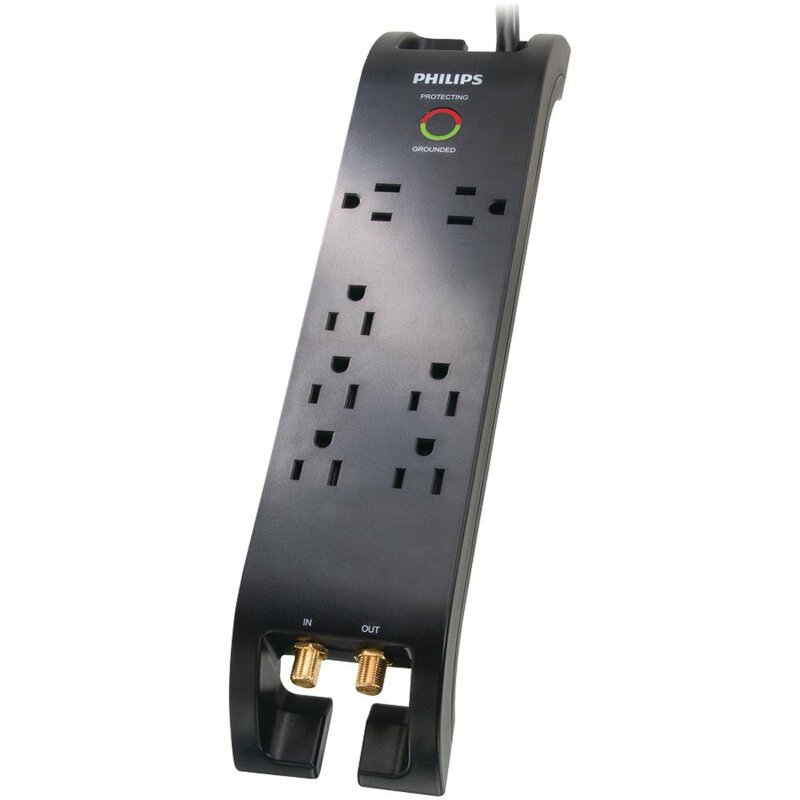 The Philips SPP5074E/17 home theater surge protector provides 2160 Joules of protection. There are seven outlets, and three are adapter-spaced. The coax connections have been made more secure with protective coating, and automatic child safety outlets that have been integrated as well. Every purchase is covered by a connected equipment warranty plan. 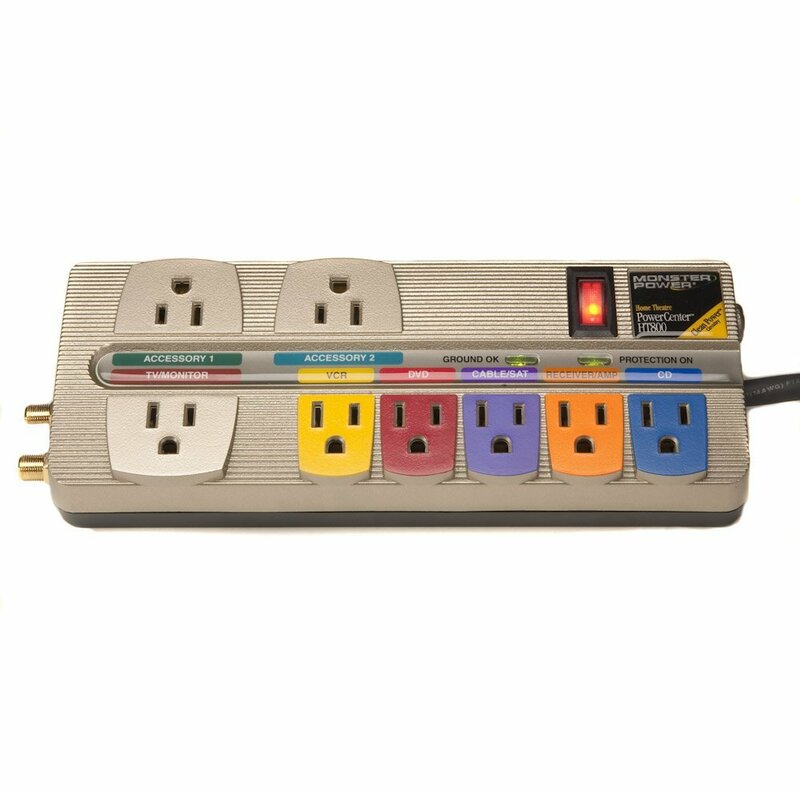 The Monster Power MP JP 700 home theater surge protector is made with seven outlets, one of them telephone and another coaxial. For additional convenience, the surge protector has been made with an easily mountable design and a six-foot-long power cord. The Panamax MR5100 MR5100 surge protector has been specially manufactured for a higher degree of protectiveness and filtered power production to any home theater systems that it services. It features eleven filtered, protected outlets with Automatic Voltage Monitoring (AVM). The surge protector is also designed with Panamax Level 4 Noise Filtration and Protect or Disconnect technology. 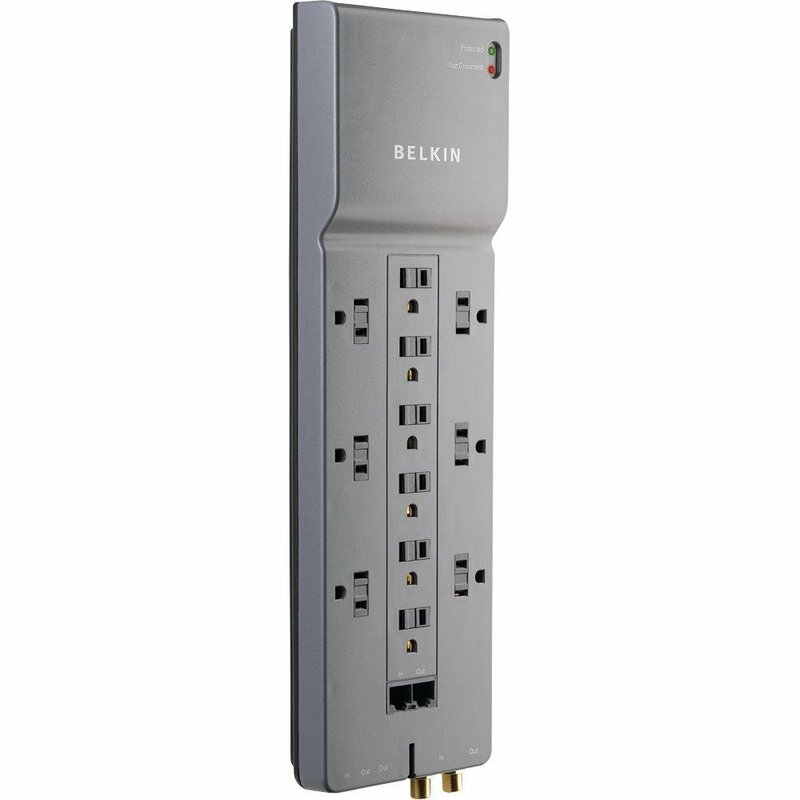 The Belkin 12-Outlet home theater surge protector provides 4120 Joules of protection. To help clear out clutter more effectively, it has been designed with cord management in mind. The spacing of of the outlets leaves sufficient room for large power chargers, and sliding safety covers lower the risk of electrical shock. 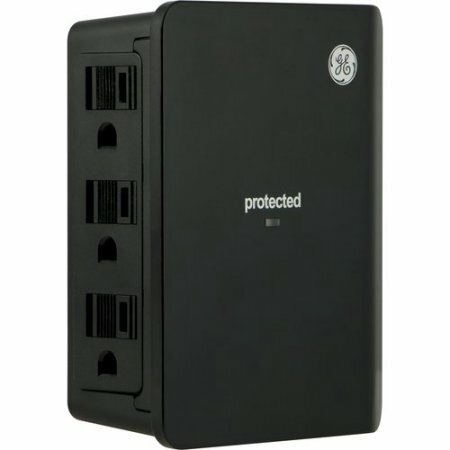 The Ge home theater wall-mounted surge protector is built with a low profile design, allowing it to easily fit into home theater arrangements without creating too much clutter. There are six side-access power outlets producing 900 Joules of protection, along with six 125V sockets. The Monster Cable MP HT800 surge protector’s Monster Clean Power Stage filter allows it to do its job without producing a great deal of noise. All of the outlets are labeled, color coded, and matched to the cords to facilitate a smoother hookup process. The Monster AC power cable, eight feet long, has a FlatProfile right angle plug for added flexibility. The design features a 24k god contact for optimized conduction and eight outlets, three of which pragmatically spaced for AC adapter placement. Home theaters are only as useful as they’re well-protected, and high-quality surge protectors are what make it possible. 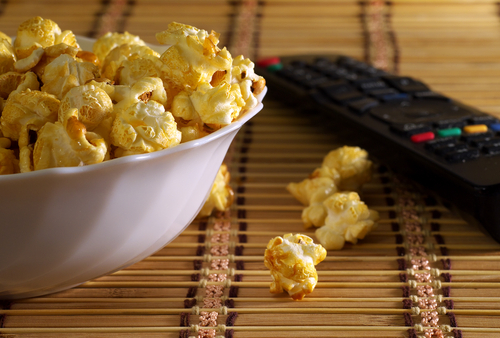 Home theater systems with substandard surge protectors wind up being far more of a financial burden than the owner anticipated; even so, surge protectors for home theaters don’t have to be expensive to be effective. 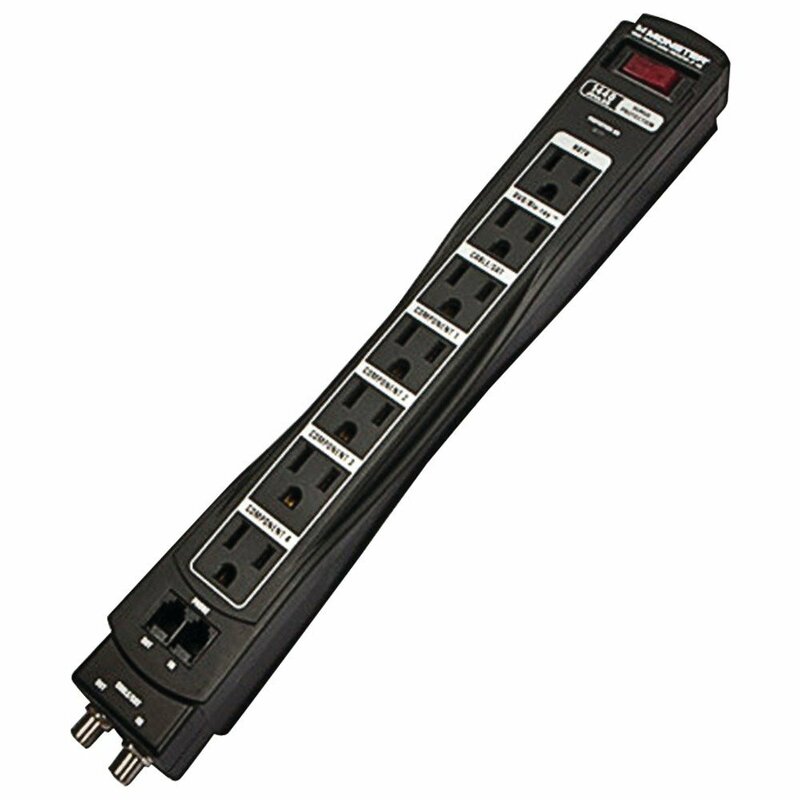 When shopping for a surge protector for home theater, make sure to critically examine qualities like its energy saving potential, joule output, circuit breaker construction, and additional forms of protection; you may find that some budget home theater surge protectors have these valuable qualities in greater abundance than some higher-end models.